With the heat of summer and a thirsty garden, last month’s water bill was rather high. While these things tend to go in cycles depending on the season, I don’t like knowing I am using more water than I usually do. I admit, I love my garden and my long showers and those things are both water hogs. In order to conserve water, I have decided to look towards my kitchen this month. 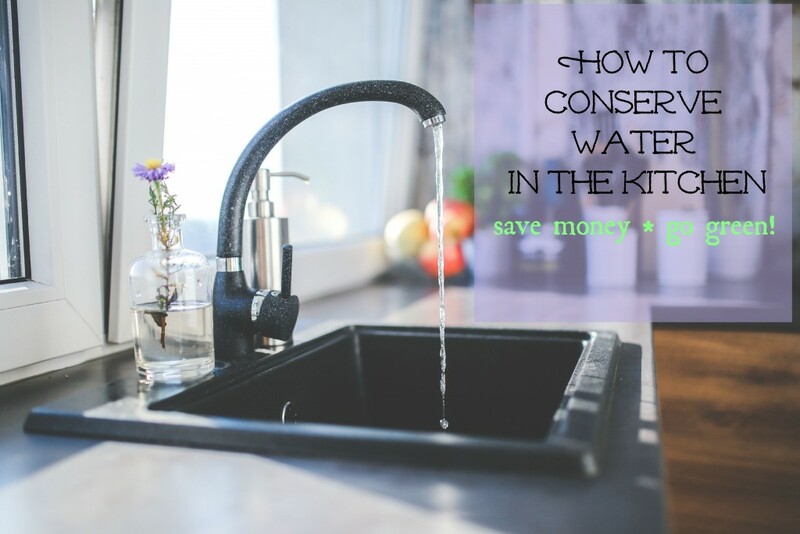 How can I conserve water in the kitchen to cut back on rising water bills? I decided to do a bit of research and share my water saving tips with my readers. If you have discovered any other ways to conserve water in the kitchen please leave me a comment! Invest in a dish washer: They almost always use less water than washing your dishes by hand. Make it the RIGHT dishwasher: Make sure your dishwasher is an energy efficient model and only run it when full. Skip the garbage disposal: Instead of scraping food down the drain and running the tap to clean it out, scrape food into the trash or a compost bin if appropriate. Think smart if washing by hand: If you do have to wash dishes by hand, don’t let the water run continuously. Plug the sink, fill with warm, soapy water and then wash. Rinse with cold water and use it sparingly. Keep it cold in the refrigerator: Keep a pitcher of cold water in the refrigerator rather than letting the tap run to get cold every time you want a glass of water. Choose tap water over bottled : It takes about 1.5 gallons of water to manufacture a single plastic bottle. Save money, skip the plastic and conserve water by drinking from your own faucet. Wash food with care: Wash fruits and veggies in a large bowl of water and scrub them with a vegetable brush instead of letting the faucet run. Water is not for defrosting: Think ahead and thaw your meat in the refrigerator overnight rather than letting it sit in a bowl of warm water. 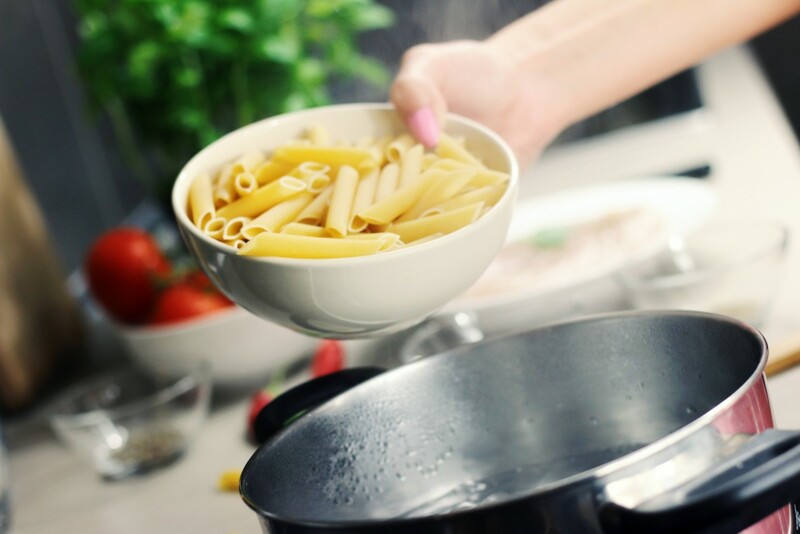 Reuse your cooking water: The water you use to boil pasta and veggies can be used to water your plants. Just make sure you let it cool to room temperature first! This little tip will help you conserve water in the kitchen AND the garden, which is always nice! Double Duty Cooking: Invest in a bamboo vegetable steamer that you can set over a pot of boiling water. That way, you can boil your pasta and steam your vegetables at the same time. Fix leaks: A drippy faucet is a waste of money and water. Call in a plumber to fix all leaks as soon as you notice them. More jobs for the plumber: While you have the plumber in fixing the leaks, have him add a recirculating pump to cut wait time for hot water. Do you have any other suggestion on how to conserve water in the kitchen? Trying to live a greener life? Follow my Green Living Tips board on Pinterest! Follow Diane Hoffmaster’s board Green Living and Ecofriendly Ideas on Pinterest.